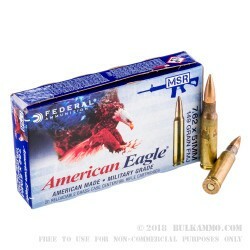 This military-grade 7.62x51mm by Federal American Eagle will have you slaying targets on the range. 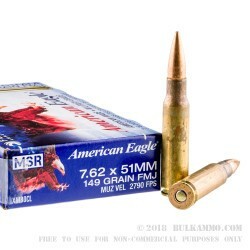 These American Eagle rifle rounds have 149gr full metal jacket (FMJ) projectiles. The copper jacket is crimped into place around the lead core to prevent bullet setback. These projectiles have an average BC of 0.456, but Federal's strict quality procedures ensure these bullets are incredibly consistent. You can anticipate a muzzle velocity of 2790 fps and a matching energy transfer of 2575 ft/lbs. This 7.62x51mm is most accurate when fired around 200 yards from the intended target. Federal constructs this 7.62x51mm ammo in their Anoka, MN facility using their own Boxer-primers and new-production brass casings. 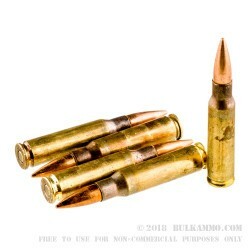 The brass casings are non-corrosive and reloadable and these bullets contain some steel in the jacket making it attracted to a magnet. Q: Are these rounds remanufactured or what's up with the dirty necks on the cases? A: Hello Tim, These 149gr. 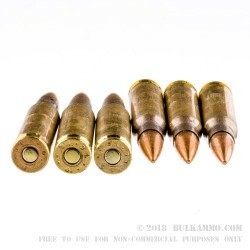 FMJ rounds by Federal in 7.62x51 are not reloads and are factory new. The discoloration on the case necks is from the annealing process during manufacturing. Since these are NATO rounds, they leave the annealing discoloration in place and don't polish the cases.